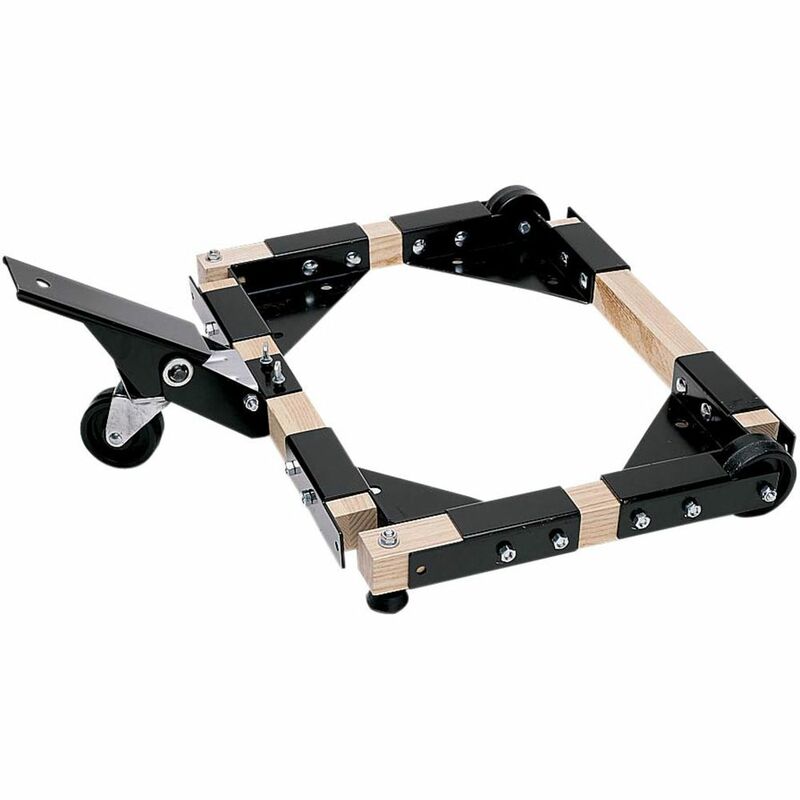 This sturdy, affordable mobile base hardware allows you to build a base of any size by adding wood stretchers in whatever length you need. This adds up to big cost savings, especially when compared to large mobile bases that are ready-made. Just step on the generously-sized pedal and the mobile base raises the tool onto a single swivel caster. Tripod design allows for easy maneuverability. Mobile base raises tool approximately 3/4" off the floor. 1-1/2" square hardwood stretchers supplied by user. I CUSTOM BUILT A ROLLING BASE USING THESE DETAILS FOR MY NEW LAGUNA 14-12 BAND SAW. USING 1 1/2 x 1 1/2' OAK THIS COMBINATION MAKES A STRONG SECURE BASE FOR A NEARLY 400 POUND PIECE OF SHOP EQUIPMENT. BEATS PAYING OVER $160 FOR A FACTORY BASE AND IS BETTER IN MY MIND. I have 3 of these. They are strong, easy to assemble and work great. Works well made wooden frame from white oak. Saw weighs about 300 lbs. Enables me to move it with realtive ease, and sets very stable when in the non-moble position. For the price differance I would recommend this moble base. This makes a strong base for all your stationary tools. This base is awesome. 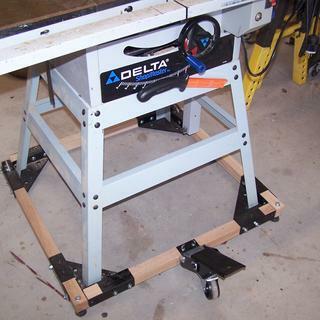 I am using it for my table saw and moving it to anywhere in my garage is so easy now. If there is a need to reposition a heavy shop tool this is the solution. I placed an older 12" Craftsman Table Saw on this base using some seasoned maple wood i had stored in a barn. I used to struggle or needed help to move the saw. Now I just press down on the caster and it glides with ease. Have not had a wobble problem as some people have had due to a three point stance. I would highly recommend this product. Used this to move my band saw out of the way when not needed. It works perfectly . Easy to move the saw and the base is very stable. Well worth the money paid. Works very well. Recommend one thinks through how the get the completed assembly under the piece of equipment you want to have on the base. The base works great, was easy to assemble and is a fair price. The product arrived on time,well packaged. I've worked with better directions but assembly went well. Base works well. Great solution for drill press.. The customizable mobile base was the perfect solution for my drill press with its oddball size base. The product went together as expected and very stable and easy to move. 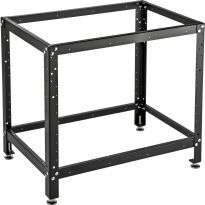 This item is very robust/heavy duty and when added to a heavy piece of equipment provides the portability I required in very small shop. This is a well engineered product and totally worth the money. Works well. I have a concrete floor but it doesn’t seem to roll very well. I honestly haven’t had time to check out why. The quality of everything is exceptional. GREAT , NOW IT MOVES LIKE IT'S ON WHEELS !!!!!! Great item, have used for years. I bought this kit several years ago as I was tired of trying to move my older Craftsman table saw (with two cast iron extensions) around the workshop as I worked on different projects. I cut the wood on the table saw to be a snug fit in this hardware. Once I had it assembled and the table saw in place, I wondered why I hadn't done it years earlier. I couldn't be happier, having the ability to move the saw around for a particular cut, or just to move it aside. Very sturdy and stable. Very happy with this product! I bought this and donated to my local Art League to move their clay roller (HEAVY) around the studio. I also use these mobile bases in my woodworking shop. It’s a great tool for my tools!! Works great but after about 10 years the peddle got a little stiff, so I sprayed with some silicone. Don't do that! Now the peddle doesn't hold the saw up and I need to clean it! It's doing what I asked it to do. I'm using it for an 8" jointer, the heaviest tool in my shop. I'm not intending to move it, but I like having the ability to move it if need be. I had to build supports longer than my first measurement due to "ears" on my jointer base, but it still works. There is some slack between the set down onto the feet and the lift up castor, but not too much to overcome. A better design may be to have the bolts in the rails go down into the bottom of the supports rather than being horizontal, which would enable the user to to remove slack from less than tight fitting rails. Over all, still very happy with purchase. I wanted a mobile base for my Jet Midi Lathe. Ordered this based on positive reviews and am quite happy. One needs some reasonable carpentry skills to size, cut, drill your Hardwood. Don't use pine; you need Hardwood. Nice kit, easy to put together, plenty strong enough for 250 pound jointer/planet that I put on it, and easy to roll around. Good quality materials and the up-down mechanism on the third wheel works like a charm. Recommended. This is a fine base. The base works great and the peddle is a nice feature compared to other makes. This rolling base works great! It was easy to assemble and can be made to fit any sized base. I have a heavy 14" bandsaw on one and it makes moving it a snap but it is still rock solid when the caster is raised. To be able to construct different shapes for different tools worked very well for our manufacturing. My fifth Rockler universal mobile base. I love them! The fit is always perfect, the wheels roll easily, the lift mechanism works great. 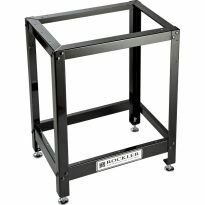 I think this makes my fifth Rockler universal mobile base. I love them! Perfect fit, great wheels. Great product. Made well and works. Love it! Used red oak and it works well. Does the job. The product was just what I needed to make my Ridgid jointer mobile. Measure how much wood you will need, then follow the instructions and your done. I own 3 sets of these mobile base set ups. My equipment rolls quickly and easily from spot to spot. When it need to secure the equipment in place, a quick flick of my foot on the lever and the equipment is ready to use. To return the equipment to its storage location, a quick depress of the lever and everything is ready to roll. Mobility of equipment is a necessity for my shop as it is small. I have used other mobile bases. Nothing works as easily as this arrangement. to move your large tools around. Best mobile base available. Allows keeping my workshop orderly and clean by simply rearranging when needed. Works great, easy to assemble. Got a bit confused with installation instructions for the front roller wheel. Contacted customer service who was very responsive, helpful and knowledgeable in quickly solving the problem. I really like the one pedal adjustment. I cut the boards on the side like the instructions and have movement in the front when I put the wheel down. I'm going to rework the front and side boards with a half-lap to give it more strength. Overall worth the money. Great quality. COMPARED TO THE OTHER MOBILE BASES I'VE USED, THIS IS HANDS DOWN THE BEST OF THE LOT. 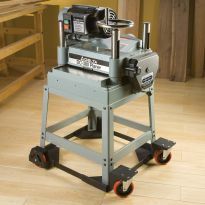 I JUST BOUGHT MY 4TH ONE FOR A BANDSAW, IN ADDITION TO THOSE ALREADY IN USE ON A TABLESAW, JOINTER, AND ROUTER STATION. The assembly time took a bit. The upside to the ability to customize the sizing offset a bit for the time it takes to assemble it. Truly a great and cost effective solution. 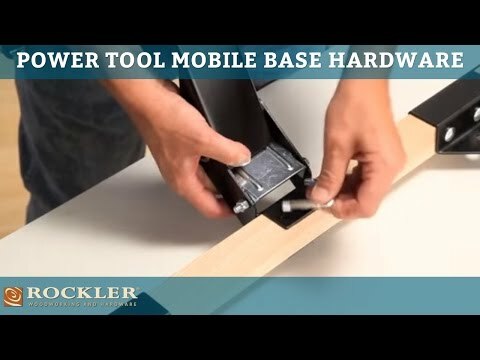 I was very positively impressed with the quality of the mobile saw base from Rockler. In comparison with other saw bases on the market, I think the Rockler base provides the best value for the price.It offers custom fit for any saw, and performs well. GOOD AS IS FOR SMOOTHS FLOORS. HAD TO ATTACH LARGER CASTERS DUE TO UNEVEN GARAGE FLOOR. This is my 2nd base I have purchased from Rockler. The first one I bought for my table saw a couple years ago. I loved it so much that I bought another for my bandsaw. makes moving heavy equipment a breeze. Do yourself a favor and print the 4 page pdf download instructions rather then the ones that come in the box. The pdf is 100 times clearer and detailed on what you need to do than the instructions in the box. Rockler should put the same instructions in the box as the pdf. I acquired this model from an oldtimer, and I have found it to be great. It is versatile and convenient. I especially like the one-pedal lift. I will continue to buy these mobile bases for all of my big tools. It's the perfect base for hubby's bandsaw. I have 2 others. They’re great. wanted this item for sometime. with the drop in price had go for it. Like that it can be customized to different bases of stationary tools. I've used this base for other heavy shop tools and found it easy to assemble and it does the job. I have a small shop and need to be able to move my tools around. I have three other and they've made my small shop much more efficient and enjoyable. This base claims to hold twice the weight as the Delta mobile base does. I am setting up my shop and I have to move some equipement myself. this looks like it will, help. Most bases don't fit my stand. I can make this one work. Needed to move tools in my limited shop. We'll see how it works and consider whether purchasing more would make any sense. my homemade one for table saw didn't work out well. I think I'll be able to use this to make a very heavy bar that I am refinishing for my son easier to move. best options for the price. Best option for a mobile base for my new 360 lb lathe. 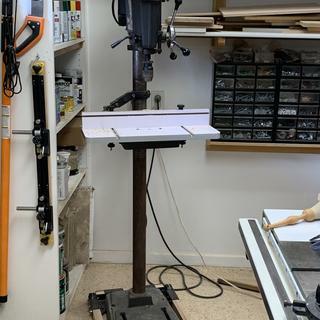 Well I could not find a mobile base for my standing Powermatic Drill Press. This mobile will be an exact fit to my Drill Press. 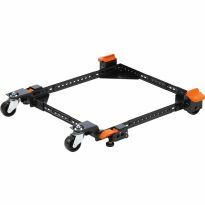 Good reviews and have a Dewalt cart with similar wheels that works well. Adjustable sizing. Tired of dragging my 300lbs bandsaw. 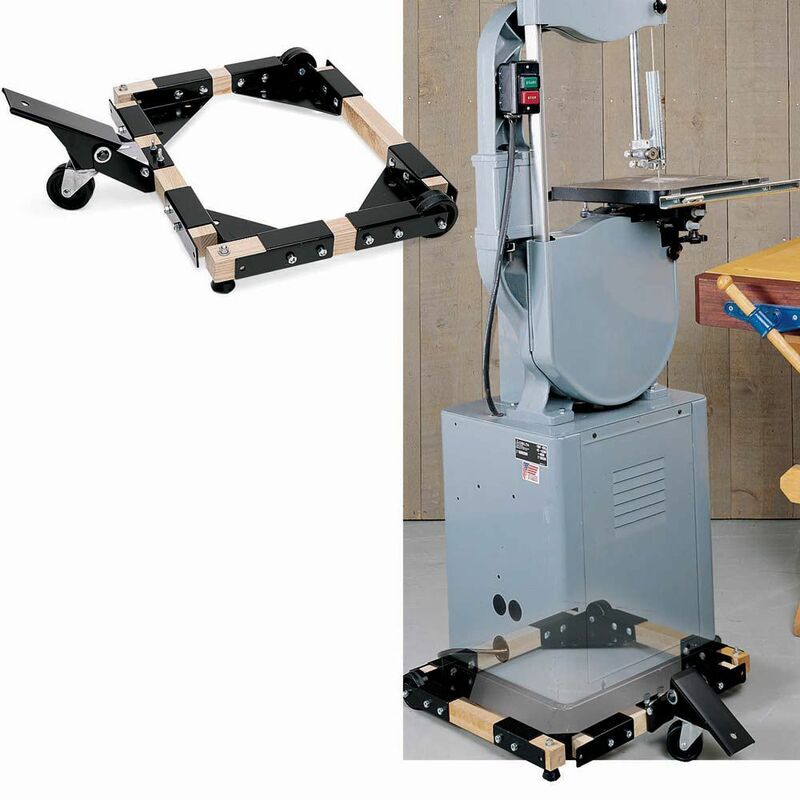 Want to be able to easily move my band saw, and this looks like it will serve the purpose. Project for our local Elkhart Art League for a slab clay roller to move around the studio as needed. BEST ANSWER: I believe it's around 3 inches. Surely, Rockler can provide a definitive answer. One point: My table saw has two feet at the back that require the front to be raised a couple of inches in order to lower their wheels to the floor. This caster didn't quite make it, so I modified it to increase the lift. 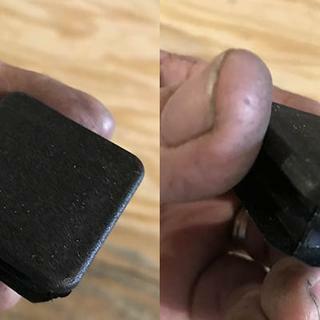 Unless you can verify that you won't have a similar problem, or have machine tools that can do the heavy duty modifications, better look at a different product. jessica - i used oak for the wood to connect the corners, and i have my 8 1/4 akita table saw with it. wheels r 3" dia. no problems! if u have a heavier tool, rocker also has the hd stand, that i purchased for my 15" planer. that tool must weight at least 200#'s and the table saw 60#'s. both accessories r worthy for the value. It measures 2 and 7/8" in diameter by 1 and 1/4" wide with a slight crown in the middle of the wheel. I fabricated a three point stand welded from 2" x 3" 10 gauge steel tubing. A Powermatic Model 50 6" jointer weighing ~300 lbs.is mounted on the stand, and it swivels and rolls easily on the concrete floor of my shop. I Measured mine and they are 3" diameter. My table saw is cast iron and I can move with no problem. I have another one that I use on a handsaw. They work great! Three Inch Diameter and One and Three Eights Inch Wide. What is the load rating for this wheel? The base of my Jet Jointer has small tabs at the front and back in the middle of the bottom of the cabinet (for bolting the tool to the floor). Will these interfere with the jointer sitting on this mobile base? BEST ANSWER: That will depend on how far out the tabs extend beyond the basic outline of the base on the jointer. If the outline of the base is such that it can sit on the flats at each corner of the base where the casters are and still accommodate the tabs, I see no reason why it should not work. Depending on the type of wood used for the wooden extensions between the base corners, it may also be possible to relieve the wooden extension pieces to allow the tabs to sit down into the wooden rails and still have enough strength in the base. 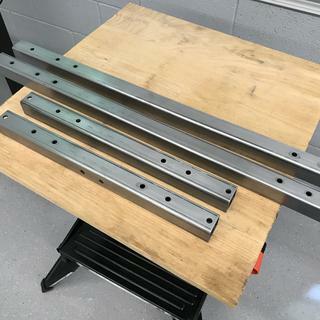 Another option is to have the extension pieces between the corner pieces where the casters are made from square steel tube cut to allow the tabs to sit flush. The dimensions of the mobile base are whatever you determine them to be with the hardwood stretchers you supply (fabricate). I placed a plywood panel inside the base that my bandsaw sits on top of. You can either do something similar or notch out the wood stretchers to allow the tabs on your jointer to fit in for a more streamlined appearance. Just don't notch out so much material you weaken the base. I have these on my joiner and my plainer and just bought them for my band saw---They work perfectly in all instances. Does this mobile base hardware include the caster? Or must I buy the caster separately? Thanks! BEST ANSWER: Yes all wheels included. The only thing you supply is the wood. I have two of these, one on my jointer and one on my bandsaw. Yes, the caster is included with the rest of the base hardware. It included the caster as pictured when I bought one. what is the minimum dimension base can be made (L at side rail x W at front swivel)? With a narrow base, the stability of what is mounted to it has to be considered. Tall things can get top heavy on narrow bases, especially when they are moved. Thank you for your insight. Center of gravity is an issue so a tricycle will probably not be the best approach for a tall drill press. Looks like a quad is the way to go! Thanks again. Dim. L 12.25 By Dim W 15.25 approx. How well does it lock ? BEST ANSWER: Very well, you disengage the wheel when the tool is in use so the base is securely on the floor. To move the tool the wheel is engaged and the base is lifted. Having only three contact points while moving does make things a bit rocky but I have never had any issues. 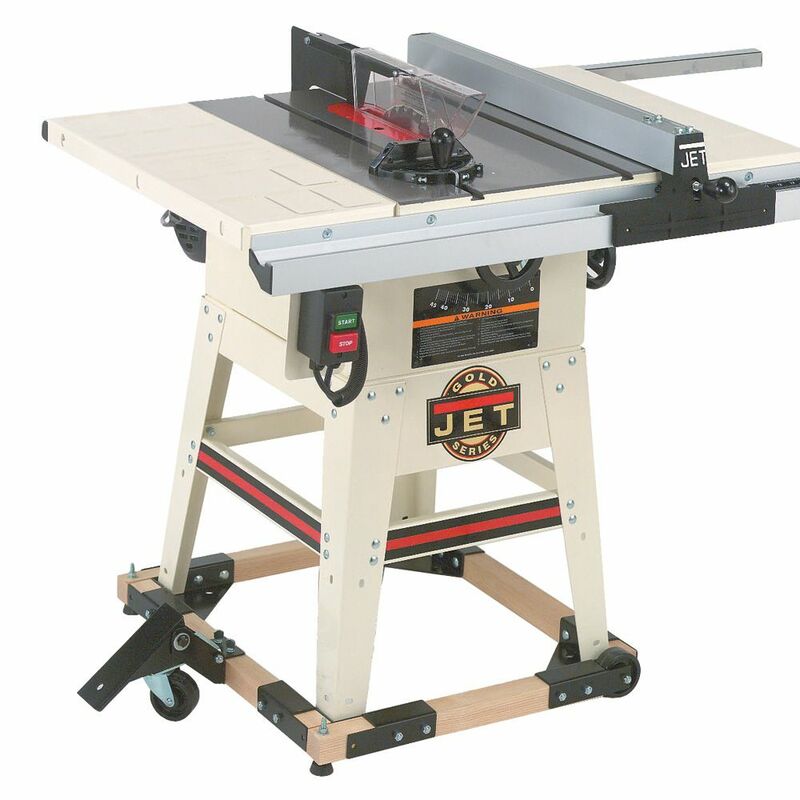 I am using it on a jointer and a band saw, very happy. It locks very well, I move it around my garage all the time, cut with it in different area, it is a concrete floor,(so the floor isn't perfectly level) and the saw does not move at all while using it. . Hope this answers your question. I use this item to move my router table outside to minimize router dust within my workshop. Just make sure you drill holes correctly in assembling. The locking mechanism works fine for my purpose. Locking is no problem. But using on a bandsaw with a narrow base and high center of gravity results in an unsafe tilt. I will look to replace it with a different base. It works great have this on all my big tools because of limited space. I put mine on a 6” planer and had no issues, rock solid. Locks solidly in place if properly adjusted. They lock fine, I have three of them. Does the big step-on caster get in your way if placed in the front of a drill press? BEST ANSWER: I put the step wheel in the rear of my 18" Grizzly G0514X2B Bandsaw so that I would no risk it getting in my way. 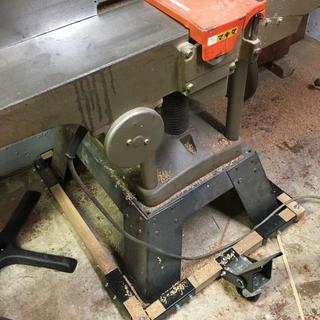 You can find a link to my project assembling this Rockler mobile base using 1.5" steel tube on the woodnet forum if you search for teetomterrific and select the post with the title "Another Mobile Base Project" I think it is easier to steer from the column side of the bandsaw. I believe the same would be true of a drill press. You will want to guide the movement from where the Drill; press is heaviest so it is stable. I have mine placed at the front of my Powermatic PM2800B drill press and it is no problem at all. I think It would be impossible to stand so close to the drill press during operation that your feet would touch the step-on caster. The push down pedal doesn't have to be on your work side, on my band saw I put the push down pedal in the back. The Idea is to be able to move it were you want to work. I think it will , I used my on the side of my table saw. It works great. Where can I buy the 1.5 x 1.5 inch hardwood stretchers needed to use this product? I've looked on Rockler - and not there. Do you have suggestions? BEST ANSWER: I used 1.5" square steel tubing. Drilled holes in it just like I would have done the wood. i buy my material from my local hardwood suppiier . i am in the st.louis area so i go to st.charles hardwoods in st. peters or fenton mo. for my stand i used 8/4 maple .i buy a piece wide enough to get 4 pieces for the frame.if you have a table saw the rest is easy, h i hope this helps Norm. Hi John, I ripped down some maple (3/4 x 1.5)and glued 2 pieces together. Works great! Make/cut them ur self. I used oak. 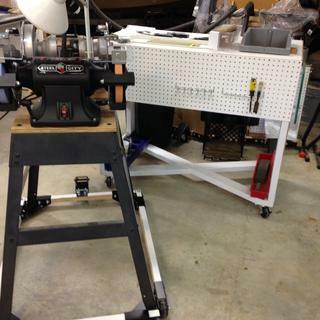 Which side of the mobile base do you mount the foot lift for a 14" Powermatic band saw? I used the short side. It doesn't matter which short side you choose. Based on the video, it looks to me like the base becomes slightly tilted at the end with the locking caster. Is this the case? And if so...doesn't that mean that you would have to use the tool in the unlocked/moveable setting in order to have it level? BEST ANSWER: The locking castor in the front is to lift the tool base to move the tool on the base. the locking castor is disengaged and the base rests on the rollers at the back corners and levelers on the front corners. the base sits level when equipment is in use. I think its a 3d perspective error. 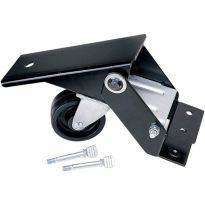 The equipment can be leveled with the base locking caster "up". I'm not happy with rear rollers on the one I built. They do not turn on bolts provided. 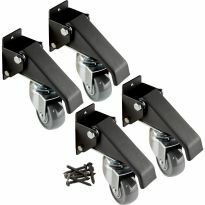 Has anybody replaced these with good casters or wheels? Advise? Thanks!!!! BEST ANSWER: I haven't used mine too much but the weight of my saw appears to be right at the max for this base if not just over the limit. I treat it very carefully and move it around slowly thinking it might fail anytime. All the wheels (castors) on my base turn however. I had to make adjustments as well. Also after a couple of years, the cam on the lift wore out. After going back and fort with Rockler, it got replaced. How much weight is the step pedal capable of lifting? I ask because I weigh only 150 lbs, but would need to lift my 600 lb jointer, perhaps half of which would be borne by the pedal. BEST ANSWER: This tool raises my saw 2.5cm while the pedal moves 20cm suggesting a mechanical advantage of 8:1. However, when the pedal is full up, it is at 60deg from the horizontal which would reduce the force perpendicular to the pedal by half. So, I would say that, in the beginning of the stroke, the mechanical advantage would be 4:1 and increase to 8:1 as the pedal moves down. In my opinion, it would only take half of your weight to lift your joiner. Ron, that was a very thoughtful and informative response--EXACTLY what I was looking for! I see much shorter pedals on other models, except the Laguna ones, which are specifically designed to fit their cabinets, and are rather expensive (I have one for my bandsaw and it works great). Thanks!!! if I was to purchase this item what type of wood would I buy and where would I get it? BEST ANSWER: I used 2x2 poplar, got it from a local home improvement store. You could use 2x2 oak if you have a very heavy piece, but the poplar seems to work great for me - I'm using this as a mobile base for a table saw and it works great. Does this permanently raise the saw 3/4” off the ground? BEST ANSWER: Yes. The feet of your equipment stand fit onto the corner brackets. The only way to change the overall height of your saw/equipment would be to shorten the feet of your saw/equipment stand. Yes. 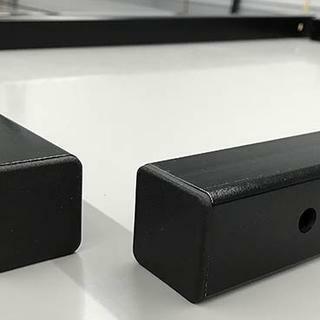 The black, metal corner brackets that the saw feet rest on are 3/4" to 7/8" higher than the floor (in the parked position). When moving the base, one end is raised an additional 3/4" (1.5" total). I have a DeWalt table saw with a stand that has 4 1" square tubular legs at a 45 degree angle to the floor. Will this saw work with this platform? BEST ANSWER: yes first measure the width of the saw table legs at the bottom , then make the legs on the mobile stand that length , just remember the table legs set inside the mobile base. Thank you very much; that makes it clear. The stands will fit most table saws and other tools as u make the stand whatever measurements that r needed with the wooden inserts that u provide. How steep is the angle when you press the lifter? 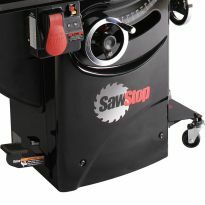 I want to use this on a table saw with a 52" extension table (SawStop Professional). 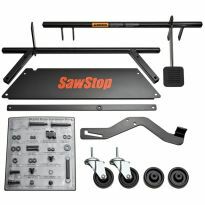 The SawStop integrated mobile base says it will move the entire assembly, but I wonder whether this design will cause the extension table legs to rub against the floor. BEST ANSWER: I have this base on a Jet table saw. 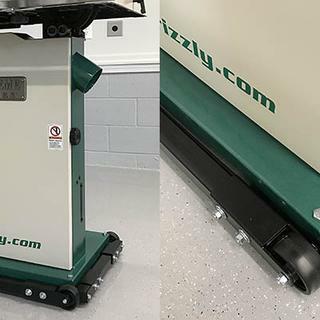 With a level spanning across the table top (wing to wing) there is very little difference in the angle of the table top with the lifting device up or down. I could not measure even a degree of difference between the two with one of those magnetic based protractor/angle finders. The problem of dragging the extension table legs may be more of a problem with the floor itself. I find that even though the floor appears flat, there are places that the feet on the base will scuff as I move the saw around. This is an adjustment issue that will depend on how you set the base up. I'd say the lift is 1"...I find this to be a great product. Note when putting it together you should pre determined where you want the peddle (sides or front / back). This comes into play when moving it around with the most ease. Will this work for a Delta cabinet makers saw? BEST ANSWER: It really depends on the weight of the tool. I have this stand and used pcs. of oak for the rails as the saw probably 60-70 lbs. I also have the hd stand for my delta planer. Probably 200 lbs+\-. So weight of tools determines what portable stand. Hd stand has bigger/ nicer wheels. My Delta cabinet saw has one as well as every Delta I own! If your are referring to the Unisaw the base will work very well. What is the dimension from the INSIDE of each side rail to the OUTSIDE of the wheel? I need to roll a machine through a doorway, and right now there is only 2" clearance on either side. So, the additional width, allowing for the frame and the tire, has to be less than 2" on each side. Thanks for any information, or a technical drawing. BEST ANSWER: It's 2" wide, but the nuts on the bolts make it 2-3/8". I don't think it will fit. Thanks, Dave D. I will probably still try to make it work by shaving a little off the bottom of the door stop in the casing. Might just make the difference, and wouldn't be noticeable. Good luck, you could possibly leave the nuts off and use shorter bolts temporarily. Even better! Less mess. Thanks again. 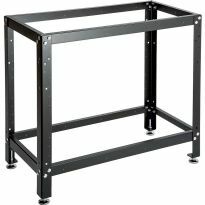 Will this mobile base hardware work on a 7 ft x 3 ft workbench? BEST ANSWER: Probably not. It requires a non-standard size stringer between the pieces. I think Rockler has rollers that would work on a bench, just not these.